A quick and easy snack or appetizer, these salty, savory, creamy bites of salami, herbed goat cheese and dill pickle are a big crowd pleaser. I am a huge fan of party snacks. When given the choice of a dessert table or an appetizer spread, I will always choose savory over sweet. Speaking of sweet… today I am so thrilled to be participating in a SURPRISE virtual baby shower for my beautiful friend Lauren of Keep it Sweet Desserts. Lauren is expecting her first baby and I’m so excited that she’s having A BOY! I know I’m a little biased but I think boys are the best. Lauren and I had the chance to meet face to face this past summer when I was visiting NYC for a couple days. 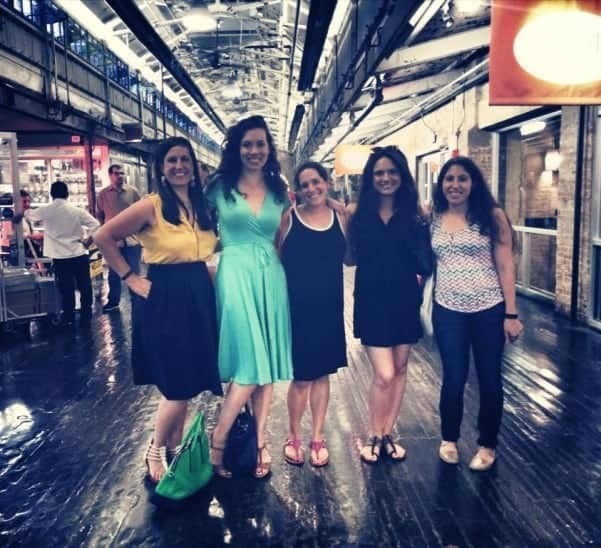 We had so much fun walking, talking and eating out way through Chelsea Market. Since I knew Lauren’s friends would be baking tons of fabulous desserts for our virtual baby shower, I decided to make a savory appetizer to balance out the sugar. Pickles in a Blanket are such a fun and EASY party appetizer that is perfect as we head into the holidays and the busy entertaining time of year. 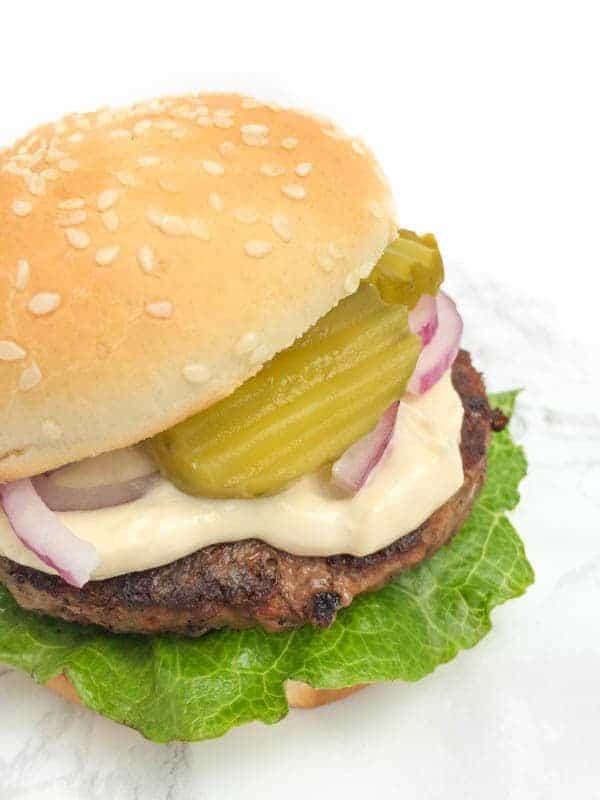 Of course, pregnant women love pickles in all forms but who doesn’t? Salty, crunchy and low calorie, these bites are delicious with a cocktail but frankly they make a somewhat healthy, high protein, low carb and gluten free snack any day of the year. Win Win. Happy Baby Shower Lauren!! I can’t wait for your little one to make his debut into the world! 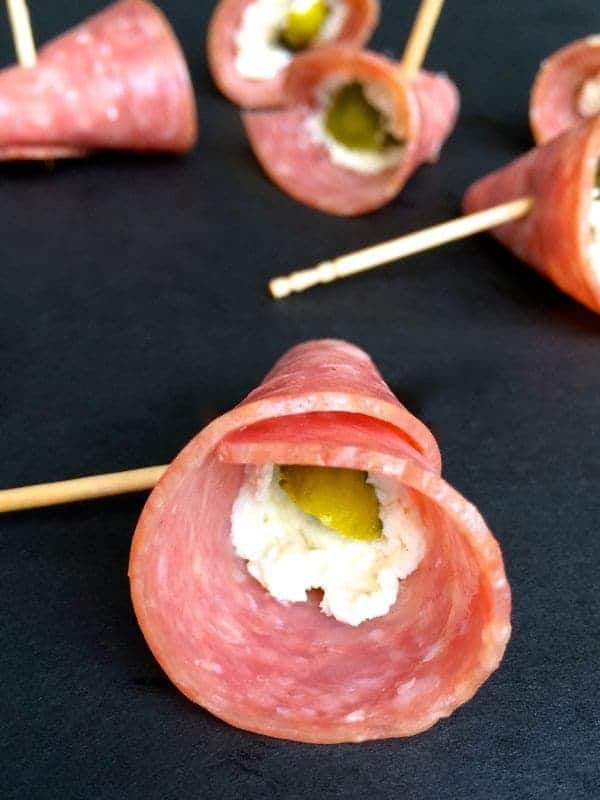 A fun and easy appetizer for any party, your guests will love these salty, savory, creamy bites of salami, herbed goat cheese and dill pickle. 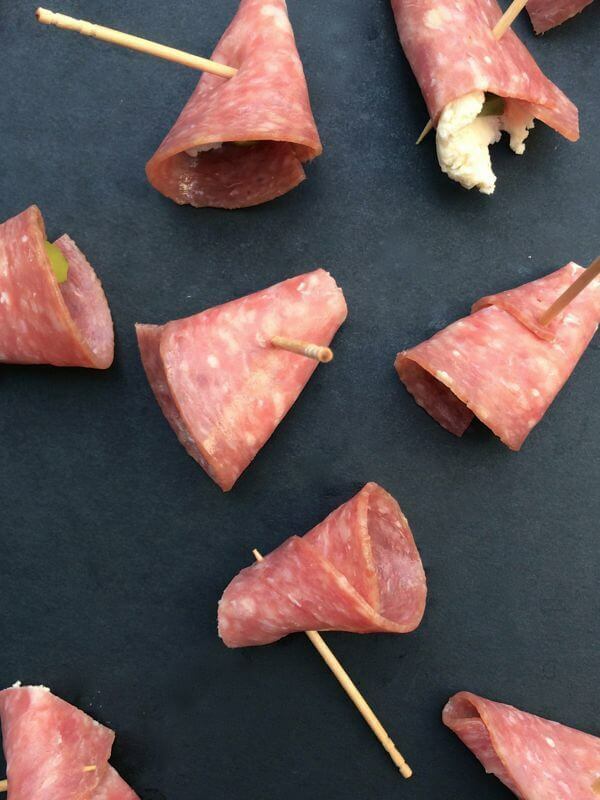 To assemble, stack the salami slices and cut in half to create 24 half moons. Lay each half moon slice of salami out on a flat work surface or cutting board. Using a butter knife, spread a small amount (1/2 teaspoon) of the cheese on each salami half starting in the center, middle. 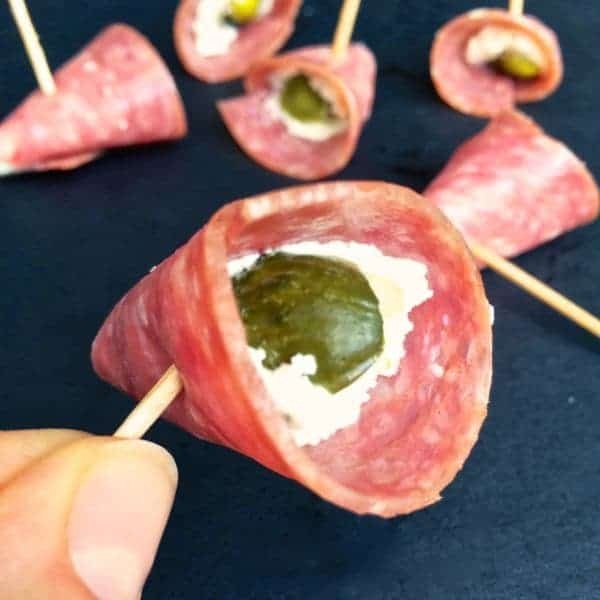 Place a piece of pickle in the center of the salami on top of the cheese and tightly roll into a cone shape. Pierce with a toothpick to keep in place and arrange on a platter to serve. There's no right or wrong way to roll the salami - it will taste delicious no matter how it looks but I found the cone shapes to work well for presentation. Be sure to check out all of the other incredibly delicious dishes created today just for Lauren! Hurrah for party snacks! Love how simple these are but I bet they taste amazing. Nothing better than party snacks! Can you makes these a day ahead? Yes I like to pop them in the toaster to warm them up! That’s exactly what I did the other night Brandon! Yeah! I associate Lauren with sweets but I’m sure she wants her salty stuff too! I love these so much. SO MUCH. I would eat 50 without regret! There’s a slight chance I had a party for 1…. I would eat plenty of these if they were at a party!! Perfection! They are so addictive and relatively good for you as far as party food goes! 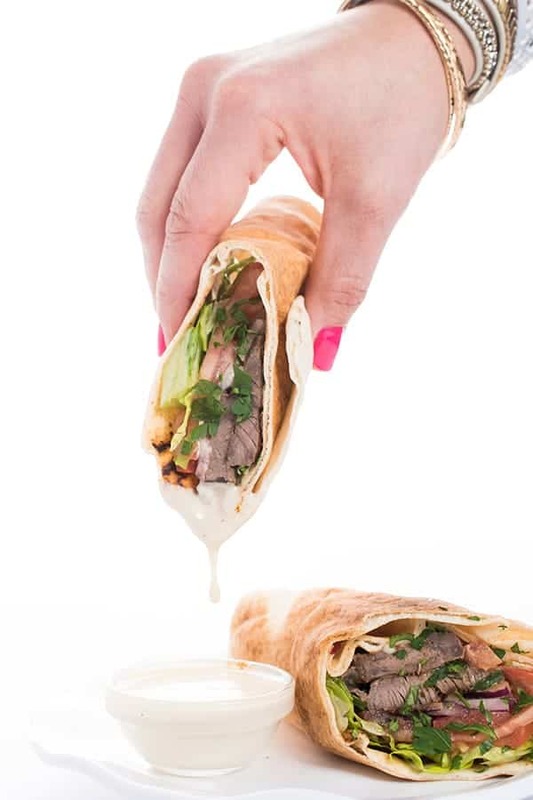 i absolutely LOVE this savory little appetizer! so adorable, so simple! 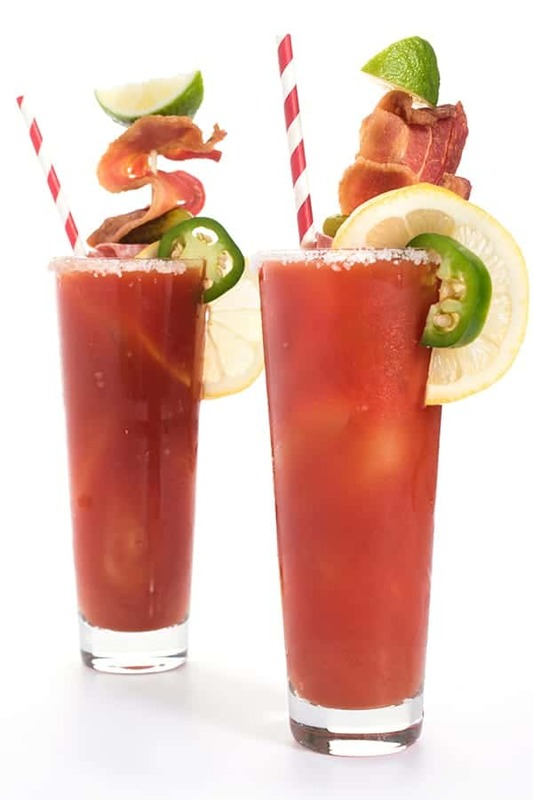 i can’t wait to add this to my football sunday repetoire! Pickles are perfect pregnancy food! Love these little bites. So jealous you actually got to hang out with Lauren in NYC! I didn’t get the chance to when I was there. She is so sweet!! I’m so glad it worked out!! Woah- these sound so good! I am so glad you brought something salty to the mix- these would be perfect for a baby shower!! Such a fun idea for a baby shower!! Congrats to Lauren!! These are the fancy version of my ALL TIME FAVE holiday appetizer! My grandma used ham and cream cheese but I am dying over the salami and Boursin cheese. They look perfect for a baby shower! Yay for Lauren!! These bites are so clever too! They are so good Erin!! These are such a cute idea and SO perfect for a baby shower! Is there anything better than salami and cheese?! awwww so jealous!!! I love Ashley and Lauren and Joanne (and have met them in person) and I love you and Audra and would’ve loved to have met you ladies! Stupid me moving out of NYC in the spring!